Chinese Calligraphy is a special art form which seeks to express the written version of the Chinese language in an artistic manner. Since calligraphy is based on the written version of a language, we need to have a simple knowledge of the Chinese language before we can have an understanding of Chinese calligraphy. There are basically eight different scripts in the Chinese language; in other words, the same Chinese character can be written in eight different ways. However, most of the scripts have become obsolete and only two scripts, the regular script and the running script, are in common use today. 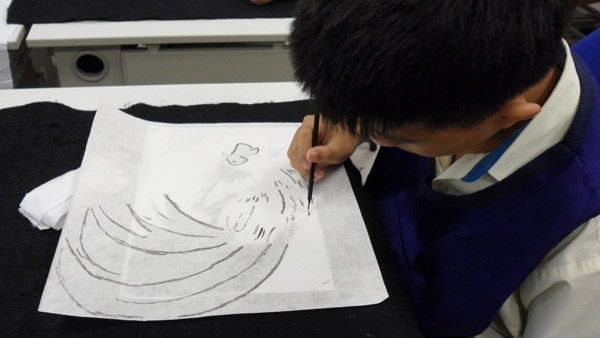 The Metta School Chinese Calligraphy club was started in 2003 with about seven students. Back then, it was one of the pioneers and is now a regular feature of our Visual Arts programme. This year, there are 11 students from the am session and 16 students from the pm session. They are taught by Mr. Raymond Lee, an external instructor who has extensive experience in teaching this Chinese art form. Mr. Lee came on board in 2003 (the first year this PVA was formed) and has taught different students for 8 years already. Mr. Lee teaches ink writing and ink painting, alternating between these two art forms every week. For writing, he teaches the Kai Shu style (regular script) to our students. A few of our students have been in this PVA for some years already. Under the skilful and caring hands of Mr. Lee, they have progressed and show exceptional talent. These students’ works will be displayed during the Metta School 10th Anniversary celebrations on 30th April and also during our Metta Shine Night in November. Do not miss out on these exhibits in these upcoming exciting events! Mr. Lee is an exceptional teacher who has cultivated interest and passion for Chinese Calligraphy in his students. According to research, this art form has been proven to have health benefits for those who practise it, such as developing calmness, concentration and lowering our blood pressure! It can also help the students in their learning of other academic subjects! Learning Chinese calligraphy appears to be a formidable undertaking at first. However, I can assure you that once you have started learning, you will find untold enjoyment and contentment in the practice and in the creative process at a later stage. A journey of a thousand miles starts with a first step of our feet!